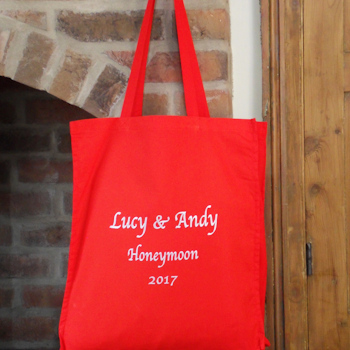 Vibrant red cotton fabric and personalised with beautiful embroidered text of your choice in the thread colour of your choice too! Perhaps a name, nickname, His or Hers, Mr or Mrs, large initials or a little messsage. Makes an excellent gift for birthdays, christmas, anniversaries and newlyweds honeymoons. Even use as a school bag or sports/dance bag!